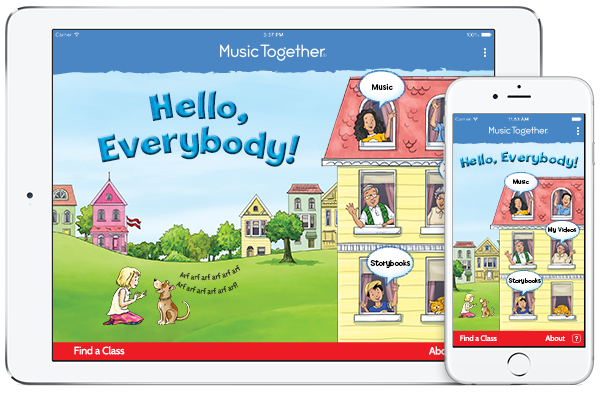 The Music Together curriculum includes a mix of original songs and traditional tunes from the folk, jazz, and world music traditions in a variety of tonalities and meters. You'll love the variety, richness and accessibility of our music. By presenting a range of musical styles from lyrical to blues, from folk to boogie, Music Together provides children with a rich music experience that stimulates and supports their growing music skills and understanding. Each semester, families receive two CDs—one for home and one for on-the-go—along with an illustrated songbook full of music-making ideas as well as the download code which you can use on as many devices as you would like. The music is also streamable through the Hellp Everybody app.. In addition, families new to the program receive a parent guide DVD and booklet, "Music Together at Home: Helping Your Child Grow Musically."